This entry was posted on Wednesday, October 23rd, 2013 at 7:09 am and is filed under Photography. You can follow any responses to this entry through the RSS 2.0 feed. You can leave a response, or trackback from your own site. Hearst Castle has the ‘largest collection of antique ceilings in North America,’ which is to say, every ceiling in the building is an original historical ceiling from elsewhere. 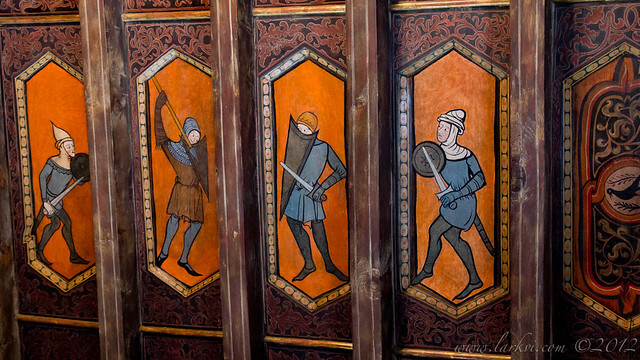 This one depicts four medieval figures with weapons: sword-and-buckler, spear-and-shield, sword-and-shield, and another with sword-and-buckler.